This week I’m so excited to be making my smoothies in my new Vitamix!!! 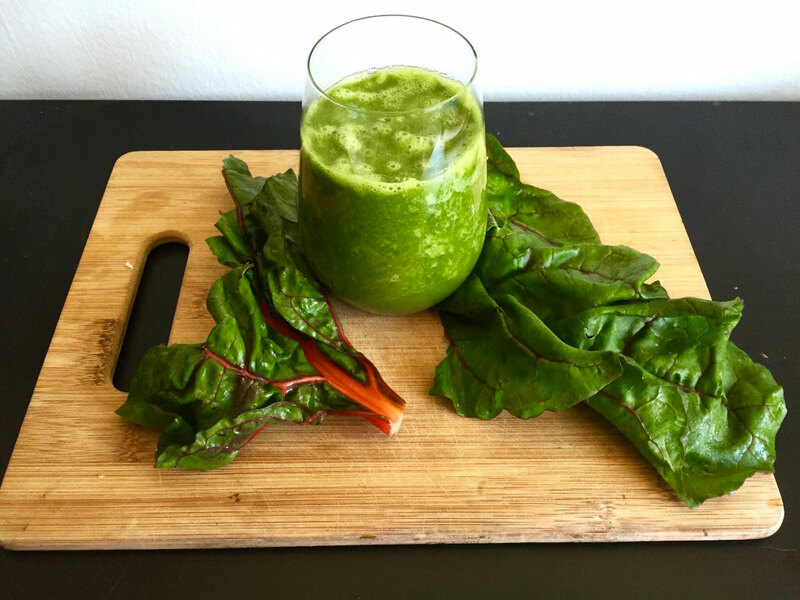 And this green chard smoothie is the first thing I have ever made in it- and let me tell you it’s delicious! This smoothie is fresh, light, and oh so delicious. The chard, which is the feature of this smoothie is a non-goitrogenic green (for all of you with any thyroid issues) and it’s also absolutely packed with electrolytes like magnesium, potassium and a little sodium as well; so for anyone who started their day with a nice morning sweat, this green can provide some of the nutrients that you lost through getting nice and sweaty (click here for a simple do anywhere workout!). Try this recipe as a meal replacement or as part of a meal (in smaller quantity) or snack! Wash and prepare ingredients- peel and pit the lemon, core the apple, wash the produce. Add ingredients to blender and blend on high for 45-60 seconds or until liquefied.